Contemporary Bangalore or Bengaluru is typically seen as a modern ever-expanding city. Its boundaries stretch in different directions based on intense clusters of development. For e.g., Sarjapur road, Whitefield – Varthur, Devanahalli, Yeshwanthpur – Peenya – Magadi and Kengeri. One such cluster to the city’s north-west is Yeshwanthpur. And often like the other clusters named above, it is seen as “greenfield development” i.e. development of agricultural but uninhabited land. Loss of such land is not seen to be of much value or rather such land is not considered to have any socio-cultural significance or history worth recording. But such an assumption couldn’t be more wrong as we have shown with Whitefield through the Whitefield Diaries short films and features (part of our Neighbourhood Diaries initiative). 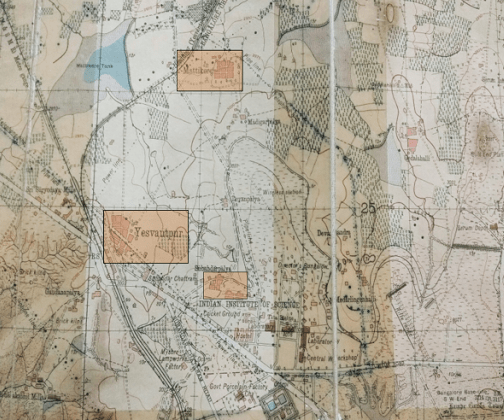 We now attempt to show the same for Yeshwanthpur with this map essay, by making an attempt to go back in time and trace its history through maps that feature this area. 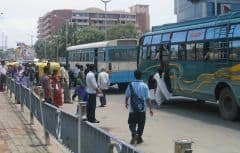 Hiding behind all the traffic, congestion and commotion of the towering blocks of Brigade Gateway, Orion Mall, and the like, stood the once village but now suburb of Bengaluru – Yeshwanthpur. Generally seen as a recent industrial area, Yeshwanthpur’s history is largely hidden behind this assumption. This neighbourhood is bordered by three other localities – Subedar Palya, Divanarapalya and Mattikere – and their histories seem to be linked with that of Yeshwanthpur. In this map, the peach portions demarcate the extent of habitation, the off-white colour demarcates the inhabited areas (towns/villages/suburbs), which are bisected by roads shown in orange. The peach colour thus shows us the settlement expanse at this time. An interesting observation that co-relates expanse of settlement with reduction in tanks (water bodies) is that though Matti Kere and Hebbal Kere are both tanks they are coloured differently. Matti Kere is marked in white as the tank has dried up – it currently corresponds to J.P. Park (the dried tank bed was filled up to make the park). Whereas Hebbal Kere coloured blue could still be counted as one of the few remaining tanks of Bengaluru. Going back in time, the 1908 Annual Archaeological Report of Mysore records a text under ‘Miscellaneous Inscriptions’. This states that a stone inscription found near Mattikere contains information relating to transfer of payment for the construction of the Mattikere Tank on 31st July 1834, during the time of the British Commission of Mysore. Apart from the tank and settlement, the railway line is of some relevance to this map essay. Note that in this map, the track is marked above Matti Kere but it had a different route earlier. Section of map of Bangalore in 1995, focusing on North-West Bangalore, Source: tourist guide book of Bangalore, 1995. Colour overlay by Meghana Kuppa. We chose this section of a schematic map from a tourist guide book of the 90s, because it shows part of Matti Kere tank in blue colour, which indicates that the tank was functioning at this time. Though this map does not clearly mark the extent of settlement, the orange-coloured network indicating roads is visibly lesser compared to the 2011 map. This gives us a clue as to how populated this part of Bengaluru might have been in the early 90s. 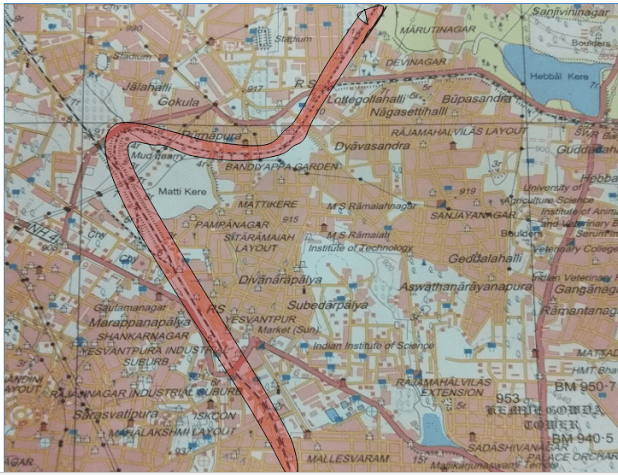 For example, Nagashettyhalli Kere finds mention on this map (just off BEL road), but it is not to be seen in the 2011 map. Today however there is a Tank Bund road that winds it way from BEL road towards RMV club. In addition, the railway line follows the same route as the 2011 map. 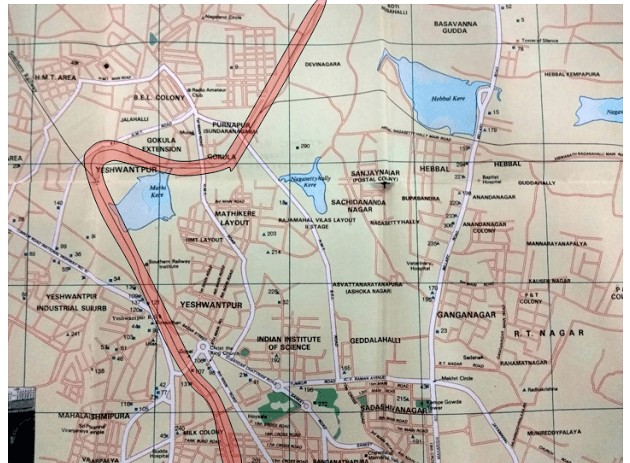 Section of a map of Bangalore in 1980 – focusing on North-West Bangalore, Source: Mythic Society library. This map from the 80’s taken from “A Map’s Street Guide to Bangalore” by Tamilnad Printers and Publishers clearly shows the boundary of Bangalore city (the thick olive green line) – though Yeshwanthpur was part of the city, large portions of North-West Bangalore were not within city limits at that time. For example, Nagashettyhalli. Also, there is another active kere (tank) south of the Nagashetty halli kere, which is not to be seen in the 1990s map (just below the text which reads Geddalahalli). More significantly, the map is of some importance to our story as it shows two routes to the railway line from Yeshwanthpur. One above Mattikere tank and one below. Officials at Yeshwanthpur railway station, when we spoke to them, made no mention of a shift in the railway line. However, there is some information available on the construction of this line, which dates back to the British era. Based on visual observation, it appears that the line south of the Kere corresponds to today’s Mohan Kumar Road leading to 1st Main road (the few residents we spoke to seemed unaware that the road was likely a railway line once). Also, this map notes ‘Subahdar Chatram’ and ‘Subahdar Chatram road’. Though the name Subedar Chatram road continues to exist today in our interviews with local people no one knew where this Chatram was located, whether it still stood or who the Subedar was. This image is not a map in that it was not measured on ground and drawn, rather it is an early satellite imagery of a portion of Bengaluru. While it may not appear very clear at first glance to viewers not used to looking at satellite imagery, it is easy to distinguish features once one knows where / how to look. For example in this image the tanks, IISc campus, railway line, main roads are very clear. Subedar Palya can be seen as an independent settlement with open land around it, likewise Divaranara Palya and Mattikere. Yeshwanthpur is noticeable as fairly large in size compared to these other settlements. One can also observe Matti Kere tank bounded by railway lines and to its east Hebbal Kere. There are many other interesting observations to be made from this image but we are not exploring them in this essay. Section of a map surveyed in 1935-36 and published in 1948, Source: Bangalore Guide Map 1948. Colour overlay by Meghana Kuppa indicating ‘Yesvantpur’, ‘Subedarpalya’ and ‘Mattikere’. This late 40s guide map records the railway track as the Yeshwanthpur – Hindupur line. Back in 1935-36, this line ran below Matti Kere tank – which was then a fully functional tank (the blue is the deeper bit closer to the bund and gray the extent of the tank). Construction of the line commenced in December 1890 and was undertaken by state engineers. It was completed in 1893. It was initially built as a meter-gauge line and converted into broad gauge in January 1983. During its construction, The Mysore Gazetteer by B.L.Rice records an ‘important find’ – Roman era coins, in 1892 near the track while work was underway. We tried to trace the current location of these coins in a limited way and were unsuccessful. Another observation is that in comparison with the 2011 map, one can very clearly see that the area did not comprise one habitation cluster as it is today. Rather it was a number of independent settlements / villages each with their bits of revenue land around a central residential zone (the peach colours). The surrounding lands were used for cultivation or agriculture or as pasture. The Indian Institute of Science campus located close to Yeshwanthpur village is noticeable, so too the name ‘Subedar Chatram’. The campus seems to occupy far less land compared to today – to its right, one can see the names ‘Medarlingenahalli’ and ‘Devasandra’. These settlements have disappeared today, although Devasandra at least continues to live on in the name Devasandra Layout. 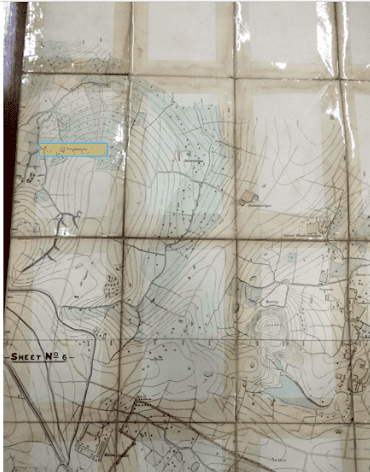 Tracing our way back to 1884, Yeshwanthpur was clearly not anywhere close to Bengaluru city limits (indicated by the red line visible at the base of the image above) and hence not surveyed or recorded. 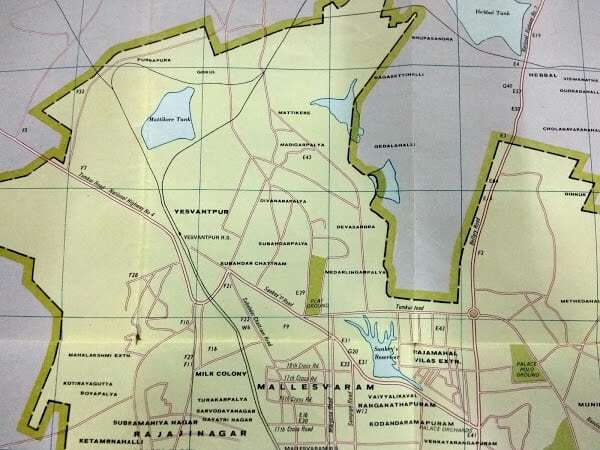 This section of the map shows villages North West of the city limits, namely Sultanpalya, Jelarpalya, Gangenahalli and Mattadahalli. On comparing this map with today’s map of NW Bengaluru, it is observable that Yeshwanthpur sits much further west of all these villages (which are now city wards). The closest village is Gangenhalli, on the top left-hand corner of the map, which is now the suburb Ganga Nagar. This suburb is located east of Yeshwanthpur (to the right of Bellary Road). 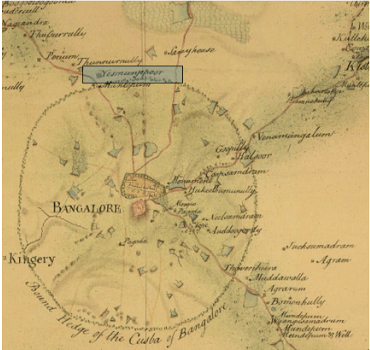 And, going well back in time, one of the earliest maps of Bangalore from the 1800s shows us the name “Yashmanjipoor” was well beyond the ‘Bound Hedge’ that marked the ‘cusba [casbah] of Bangalore’. The ‘Bound Hedge’ has been described as a thorny scrub, possibly soapnut trees, that once enclosed the city. For more details about it and other map-based historical information on the city, it is worthwhile to read Deccan Traverses by Anuradha Mathur and Dilip Da Cunha. South of ‘Yashmanjipoor’ is the name ‘Mantapam’, which is likely what we know today as one of the four towers of Kempegowda. The name corresponds to the northern tower, currently located inside Ramana Maharishi park near Mehkri Circle (and yes, it is Mehkri not Mekhri – so named after the engineer Enayathulla Mehkri). And finally a closer look at ‘Yashmanjipoor’ in 1905. 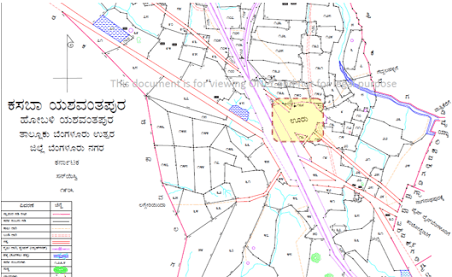 The yellow highlighted portion corresponds to the location of Yeshwanthpur “ooru” or village. A district map of Bangalore in 1905. Source: landrecords.karnataka.in (published by Revenue Survey Office). Colour overlay done by Meghana Kuppa indicating the Yashwanthpur “ooru”. Based on some field interviews in the area to understand the history of Yeshwanthpur and Subedarpalya, we discovered that this highlighted portion corresponding to today’s market was originally the heart of Yeshwanthpur. We spoke to descendants of one of the older landlords of this area (when it was a series of villages) Patel Bairanmaiye Gowdru – Nagarathamma. She told us that she was the third generation of the Patel’s family. During the interview, we heard stories of how Yashmanjipoor started out as mere grazing land, which then developed into an industrial area and is now Yeshwanthpur, a city suburb that houses urban families. Given the frequent mention of tanks in this essay, one of the stories we found interesting was her recollection of walking down to Sankey Tank to do laundry (she recollects it as the laundromat of her early adulthood). Later on, with the onset of industries in that area, her father went on to work with BHEL making porcelain transformer insulators. She however involved herself in farming a small tract of land, which is where Gopal Theatre stands today. And to close this map essay, we present an overlay of the 1905 map of Yeshwanthpur on current day Google Earth imagery. This overlay makes it amply clear that from existing as a dot on the fringes of a colonial map of Bangalore, it has expanded into a hub of important activity for transport and industries. Yeshwanthpur’s development is an interesting story overall. One can assume that it could have gained importance after the establishment of the Indian Institute of Science in 1909 along with the expansion of the railways. Both probably gave the spur to develop the area around it for public sector industries in Mysore State and Karnataka – starting with the Government Porcelain Factory, which was later taken over by BHEL as mentioned by Nagarathnamma. In conclusion we can see that urban development is typically a long-drawn process of transformation but in some cases rapid expansion over short periods of time, such as Yeshwanthpur. Note: This article was co-authored by Meghana Kuppa. 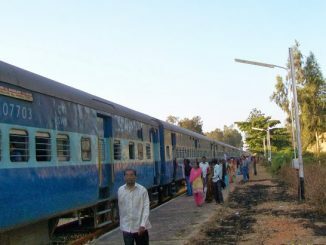 Chief Minister Siddaramaiah wrote to the Central Government Ministers and MPs, in order to get support for commuter railway in Bengaluru, ahead of the Railway Budget. Here’s what the letters say. A visit to a lake at the center of Bengaluru city unveils surprises. Deepa Mohan documents it all. Avail BMTC student bus pass now, online! Now the applications for BMTC student bus pass can be filed online and offline. Read more to know how to skip the queue and get the bus pass! There is however one issue that I am surprised. This is about use of Sankey Tank for washing clothes by residents of Yeshwantapur. Jewel Filters came up in 1896. From that period onwards, most homes had piped water [and 25,000 litres free water to boot]. I was under the impression that Yeshwantapur hobli was included in water supply scheme, since the pipelines came through the hobli. Either the official records indicating that the area was under the supply scheme was wrong or the lady expressed her impressions. I wish someone could clarify with authority. All I know is that the water supply in those parts was patchy. The Kethamaranahalli Shanbogue family gave 4 acres of land for the Kethamaranahalli storage reservoir in 1954 for Rs.1.50. Water supply improved later. There is one impormation that could be relevant to this article. Yeshwantapur was a hobli even during the British occupation of Mysore. 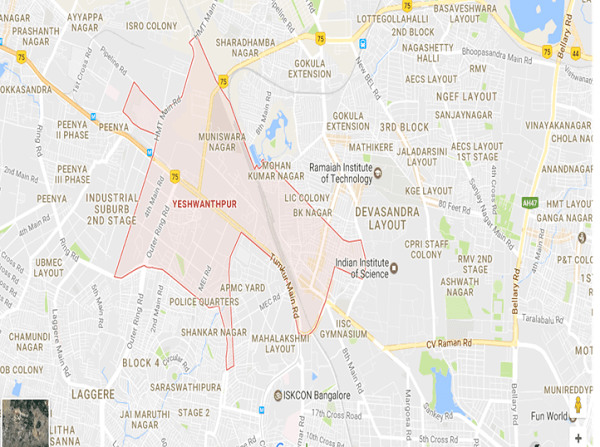 Kethamaranahalli [presently I Block, Rajajinagar], Juganahalli [II Block] and sorrounding villages were part of Yeshwantapur hobli. Malleswaram was also a part of this Hobli. Formation of Malleswaram in 1898 would have pulled Yeshwantapur into Bangalore. I would like to confirm that there were two roads abutting the Mathikere lake leading to the Yeshwantapura Railway Station. 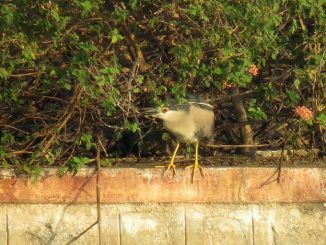 I remember that we used to go bird watching as school children in the area between 1980 – 83 on our bicycles from our school in Rajajinagar. We would take the upward reach road while cycling away from the station and come down the lower road. These roads later transformed into slums, when the Mathikere lake dried in 1984 – 85. The natural calamity was used to breach the bund and destroy the lake. Not completely relevant to the above article, but the railway line between Yeshwantpur and Hebbal, north of Nagashettyhalli, running parallel to the the ORR was known as Old Salem Line till the cusp of 2000.